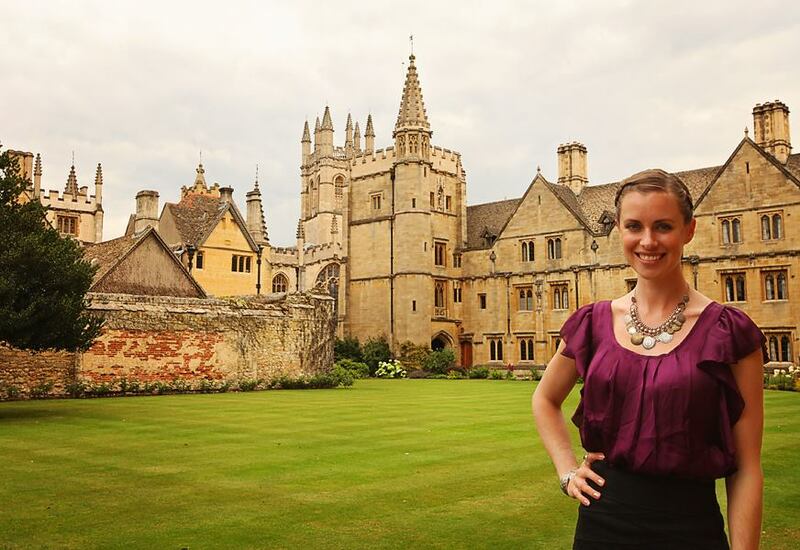 In August 2014 I was honoured to travel to the beautiful University of Oxford in England and present my research at The George MacDonald Society 2014 conference, ‘Re-Imagining the Inklings: the Victorian Roots of Modern Fantasy’. I was particularly excited to present at this conference, since it was so closely aligned with the topic of my own research, and the PhD thesis I had only recently completed the year before. The final chapter of that thesis looks at George MacDonald and Lewis Carroll (among other writers), and the ways that their writing engages with Victorian concepts of dreams, alternative states of consciousness, the supernatural, and early ideas of higher-dimensional space. When offered, I jumped at the chance to present these ideas not only among such expert scholars on George MacDonald and Victorian Fantasy, but also at Oxford – that ancient city of literary dreaming, and the home of many of the world’s most beloved authors, including Lewis Carroll (Alice in Wonderland) and the Inklings J.R.R. Tolkien (The Lord of the Rings) and C. S. Lewis (The Chronicles of Narnia). The beautiful main quad of Magdalen College, where I stayed during the Conference. My paper was entitled ‘Dreaming into Hyperspace: the Victorian Spatial Imagination and the Origins of Modern Fantasy in MacDonald and Carroll’, and was received with much excitement and interest by the audience – an interest and enthusiasm that was even, as I later found out, shared by some of those who hadn’t even attended my talk! I was happy to engage in many conversations and answer a plethora of questions after my presentation and during the tea breaks, and it was extremely rewarding to have my research, which had previously been kept all to myself as I toiled away for years in archives and over books, suddenly so enthusiastically received by so many people. It’s always a welcome acknowledgement as a writer and researcher to have that moment where you realise that it’s not just you who is excited by your ideas! The three-day conference consisted of a host of fascinating talks, including wonderful keynote presentations by Professor Stephen Prickett (pictured below) and Dr Kirstin Jeffrey Johnson, and explored the exciting origins of Modern Fantasy in the Victorian era. While many modern readers are intimately familiar with the fantasies of J.R.R. Tolkien and C. S. Lewis, not as many are aware that ‘The Inklings’, as they called themselves, frequently turned to earlier Victorian writers for inspiration, and the works we have come to think of as hallmarks of Modern Fantasy are actually heavily indebted to writers such as George MacDonald, Lewis Carroll, Charles Kingsley, and William Morris who all wrote across the later half of the Nineteenth Century. A book of the Conference Proceedings is due to be published later in 2016. I am also due to present my research at the next conference of The George MacDonald Society, to be held in Trinity College at The University of Cambridge in July 2016. Find out more on the Conferences page. Really great to hear about your research! I shall follow your blog. I’m on Facebook where I have posted pictures of George MacDonald related sites on my timeline over time. I live in Aberdeen and superintendent seven churches in NE of Scotland covering area which MacDonald knew very well in his time including Huntly and Cullen where he wrote Malcolm and Marquis of Lossie. Do keep in contact and I hope to see you again at a future GM conference. Ps I am about to be published by Wipf & Stock based on my PhD research work in Cambridge on children, imagery and language of. Thanks for your comment! I’d love to hear more about your research – I look forward to reading your book when it comes out! Take care, and I’ll see you at the next GM conference!